Being a pet parent of a kitty, your biggest concern would be to prevent your cats from hairballs. Cats have barbs on their tongue facing backwards. These barbs have an important role to play in a cat’s life. Outdoor cats catch their prey and tear off their flesh with the help of these barbs. They also help the kitties in removing parasites and other barbs from their skin. They give the benefit of removing dead hair from the cat’s coat, but unfortunately as the barbs are faced backwards the dead hair is swallowed. And, this is the way how cats are exposed to the dangers of hairballs. If your cat is vomiting a hairball more than once in a month, it is something to be concerned about. You may need to consult a vet immediately if she vomits a hairball every other day or even more than thrice in a month. The studies have shown that if the hairball grows too large, it won’t be able to pass through narrow sphincters which leads either to the stomach through esophagus or to the intestinal tract. Moreover, if it happens to pass into the small intestine, it becomes dodged there and can be fatal without surgical intervention. To avoid such deadly situations, look up for any of the symptoms and start with the preventive measures immediately. Grooming: Regularly brushing the hair coat of your cat is the simplest preventive measure. It removes the dead hair off the coat which prevents the swallowing of it. The more the loose hair present on your cat’s coat, more are the chances of hairball formation. So, exercise this basic prevention measure to avoid hairballs in cat. Keep her hydrated: Keep water by your kitty’s side all the time. Keeping her hydrated will flush out the single hair from the system before it gets accumulated and forms a hair ball. Food Lubricant: If your cat continues to eliminate hairballs even after taking precautionary measures, add food lubricants to her food. This will lubricate the intestines or digestive tracts and help in removing the hairballs easily. Food with fibers: There are many food products available that are specially designed to prevent hairballs in cats. Include such foods in your kitty’s daily diet. Moreover, your cat needs a certain amount of fibers which would move the hair clumps that are in the system and prevent from the hairball formation.Add pumpkin to your cat’s daily diet to see the effective results. Butter can give you similar results, but are high in calories. Keep your kitty’s diet high on fibers to prevent the hairball accumulation. 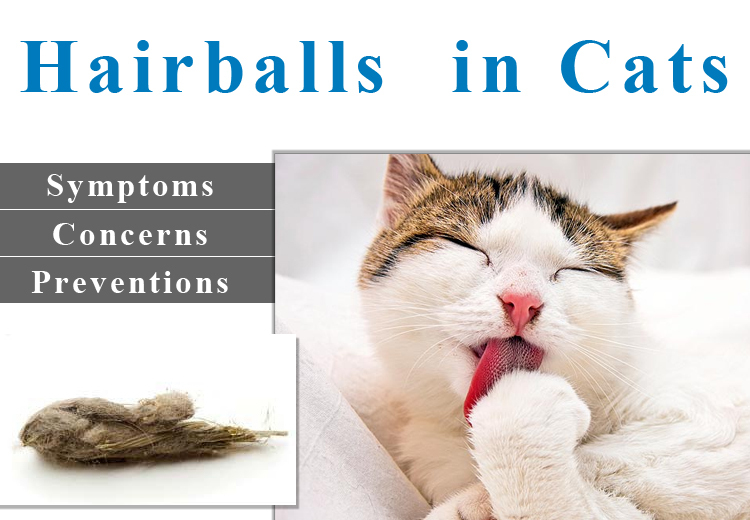 In all, occurrence of hairballs in cats is a common issue, but can be lethal if not taken care of. Being an owner of a kitty, it is very important to know the concerns and preventive measures of avoiding it. Practicing these tips may help you in combating the hairball elimination in cats.